Disclaimer: Speaking for myself as an individual in this post, not on behalf of my employer. There is a lot to be gained from stepping out from behind your desk once in awhile. I work in the Dana-Farber Cancer Institute’s Division of Development and the Jimmy Fund. Our offices are down the road from the main Institute campus, which is a comprehensive cancer center. I’m fortunate that my responsibilities bring me to the main campus often, but many of my colleagues do not get such opportunities. To help keep our entire division connected to the Institute, every year we have a shadow day where the people who work to raise money to support the Institute get to shadow someone who works in a different role at the Institute for a morning. Thumbs up for having a job you enjoy. The shadow assignments can be anything– in the past, I’ve shadowed researchers and the leader of Dana-Farber’s gift shop. Other people have followed members of the community benefits program, patient resources, maintenance, etc. This year I had the opportunity to shadow a clinician as they saw patients. It is such an intimate experience to sit in on someone’s appointment with their physician. To squeeze into the room with the patient and their family and listen as they detail their concerns and thoughts, looking for guidance and help. I was grateful (and somewhat shocked really) that so many patients welcomed my partner-for-the-day and me into their appointments. I’m not sure that, in their shoes, I could have been so gracious. The patients’ graciousness was noteworthy, in part because these were cancer patients: people touched by one of humanity’s most daunting adversaries. Their uncertainty resonated and found uncertainty in me. Sure, I do know a bit about being a patient, but not a cancer patient. I know about cancer research, but from an outsider perspective–not that of physician or patient. This peering into a patient appointment was something new. I knew enough science and medicine to keep up with the conversation, and enough to be able to empathize with the patients, but truly it was an eye-opening experience. In a morning of novel things, a few stood out to me. One was how quickly the physician was expected to switch from topic to topic. In the in-between moments when we weren’t in the examination rooms with the patients, the doctors darted around the hallways, conferring with the nurses here, with the radiologist reading the patient’s scans there, updating patient records, consulting notes,writing notes, or placing calls to other physicians. There really never was a “down” moment in the four hours that we were there. For one of the patients that day, the nurse and the physician had different plans for how they intended to handle the patient’s unique situation (another disease on top of their cancer), and they had to devise a single game plan. Knowing Dana-Farber it was perhaps not surprising to see that all voices from the care team got heard, but it was still refreshing to witness. Something else that struck me about the experience is actually a lesson I learned myself during my own health scare: while physicians are the experts, you need to keep track of your care plan and participate actively. Often patients or their families know more details and the context of the situation than the physician may remember off-hand, especially when the physician sees a lot of patients with similar diagnoses. The task-hopping required of these clinicians makes it impossible to remember all of the things you’ve discussed in prior appointments exactly without prompting sometimes. It’s not imprudent to jog their memory or ask them if they’re sure about something. You can and should question your doctors; if something doesn’t seem right to you, just be reasonable. Listen to their expertise, trust their evidence, but still make sure you’re bringing up your concerns. It was also particularly interesting how quickly the physician had to change their approach as they went from patient to patient. The patients we saw that morning ran the gamut, and each was in a different stage of their cancer experience. There was optimism of a promising diagnosis alongside terminal cases where nothing else could be done. There were chronic patients and patients for whom the cancer was not their primary health concern. It was fascinating to watch the physician read the room and get a sense of how the patient and their family members were feeling and try to meet them where they were. As with all things, I think there were hits and misses, but, for the most part the personalization of each appointment was a really positive thing. For me, because I write about forthcoming solutions in the form of therapies, it really felt like I was getting a sense of the meaning of the work. This is what it’s all about: trying to help the people that come for care. I write often about the type of cancer that the patients we saw actually have, so I’m very familiar with the drugs. It was striking to see patients feeling good on some of the newer medications, even in cases where they weren’t going to be cured and they knew it. Having a good quality of life in the time they have is really significant. You do the best you can with each unique situation, but to at least be able to offer patients the chance to feel better even if you’re not getting them that much more time still felt like a win of sorts. Maybe not the ultimate win, but not a dismal failure either. I’m extremely grateful to have had the chance to see just a snippet of the work that Dana-Farber researchers and clinicians do. In development, it can sometimes feel like we’re not actually involved in what Dana-Farber does, because we’re just raising the money. The shadow day experience helped me to feel more connected to the fact that everything we do is about helping patients. It was a good reminder of why I chose to work in a non-profit and what drew me to this kind of science writing in the first place. I wanted to be an advocate and an ambassador for science, for a cause, and I can’t think of a better one than this. It’s been a long time since I’ve shared thoughts about anything that I’ve read. Not that I’ve stopped reading of course, in the past year I’ve made my way through many non-fiction science books that I’ve enjoyed but haven’t written about. I was on a blogging hiatus, but now that I have free time courtesy of the things detailed in this post, I want to rebrand my book review series. I’m not sure book review is accurate to describe the type of posts I write. While I share my opinions, I almost never write about books I didn’t enjoy and try to avoid negative comments. I do this because if I’m going to write a post I want it to be about something I’m excited about and enjoyed rather than something I disliked. Thus, I feel calling these posts What I’m Reading is better than Book Reviews. As always, if I’ve been asked to read a book by the author or publisher I’ll let you know, though nearly all the books I write about are chosen because they peaked my interest. Even with a new name, I hope people will still be encouraged to check out the books featured in this series. When I’m reading non-fiction I gauge the success of the story by how quickly I finish reading it. Are the things on my to-do list falling by the wayside because I need to know what happens next? Am I so engaged that nearly 500 pages can be consumed within a few days, or are the pages trickling by as they lull me to sleep each night? Is the book so compelling that even the most technical details are devoured alongside the more narrative elements of the story? To cross the line from “I liked it” to “I loved it” a book needs to meet these criteria. I loved Toms River by Dan Fagin. In addition to being the name of Fagin’s Pulitzer Prize winning book, Toms River is the name of a town in New Jersey. I grew up in New Jersey in the 1990s and 2000s – just young enough to know that Toms River had a stigma attached to it, but not old enough to read the papers or understand why. When I found out Fagin was writing a book about the New Jersey town and it’s epic pollution problem, I was intrigued and quite frankly a little shocked by how little I knew about the environmental disaster that had taken place in my own home state. As far as states go, New Jersey doesn’t exactly have a glimmering reputation. Since it’s not enough to have to contend with pop culture stereotypes like Jersey Shore or the Sopranos, we also have our fair share of government corruption and industrial pollution. Yet I feel protective of the “Garden State” (when you think of the pollution problems, the jokes just write themselves don’t they?) Where I grew up, on the boarder of Union and Morris counties, was the very picture of the idyllic New York City suburb. It was hard to imagine the state had a pollution problem when surrounded by the manicured perfection of sprawling lawns, parks, and golf courses. Yet, even as a kid, while I don’t remember any specific media coverage I remember the negativity, the impression that Toms River had problems. Until I picked up Fagin’s book, that was really all I knew about it. The government started designating Superfund sites after the Love Canal case in which toxic chemicals located beneath homes and an elementary school in Nigara Falls, NY started causing health problems in 1978. Toms River made it onto the list in 1983 thanks to the Ciba-Geigy factory, a 1,400 acre site where the chemical company manufactured primarily dyes, but also resins and epoxy. The company dumped waste products from the manufacturing process contaminated with toxic chemicals on the factory property, into the nearby river, and into the Atlantic Ocean from the time the factory was established in the 1950s. Toms River is a beach community, and the toxic waste easily seeped through the porous sandy soil to contaminate the ground water in the area. The groundwater cleanup started in 1996, when I was eight which is why I missed out on the majority of the drama. Fagin’s book starts out by getting into the history of dye manufacturing. It doesn’t really sound like a topic that would be captivating, but I was fascinated by the backstory behind major chemical companies and how dye became a big business. Tracing the various companies through their founding, expansions, closures, consolidations, and mergers with clarity is a difficult task, and Toms River does it skillfully. I was hooked from the very beginning and as the story developed from the discovery of the chemical compounds used in dye manufacturing through the events that led Ciba-Geigy to open their plant in Toms River I found myself more and more impressed at how sucked into the story I became. There is a turning point in the middle of the book where the story starts to shift from explaining how the pollution got into the water in Toms River, to explaining the affects of that pollution on the town’s residents namely the rise of a pediatric cancer cluster. I may be slightly biased in how interesting I find cancer epidemiology since I do write about cancer research for a living but I feel like Toms River handles an incredibly complex science with a perfect amount of nuance and explanation. The book even gets into the nitty gritty of experimental design without making me want to skip ahead to just find out the results. The intricacies of the studies needed to prove an environmentally caused cancer cluster became the drama for a big section of the book. Woven throughout the book are the stories of the people involved from the first dye discovery through the operation of the factory all the way to the legal battle that sprung up once the cancer cluster was discovered. Generally I’d call the human element the narrative aspect of the story, the thing that drives the story forward, but that doesn’t really feel appropriate in this case. The entire thing is a compelling narrative. Still, Fagin does a wonderful job of injecting the story with the personal experiences of the people who lived it. The book culminates with settlement of the legal case regarding the Toms River pollution, and the scientific findings from the studies undertaken to prove that the cancer cluster had an environmental cause. These parts of the story are explained through the impact they had on the families of children with cancer and thus resonate deeply. 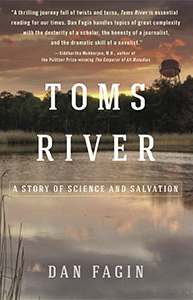 I really loved Toms River from start to finish, and recommend it for anyone regardless of your background knowledge or interest in science or environmental issues. It is just a fascinating story, told extremely well. The title of this post is a very elegant summation provided by Siddhartha Mukherjee of a talk that he gave at Harvard Medical School (HMS) last week. I was lucky enough to be at HMS (in the overflow room, sadly) to listen to Mukherjee’s talk. You may remember that I recently read and reviewed his Pulitzer Prize winning book, The Emperor of All Maladies: A Biography of Cancer. I leapt at the chance to see him talk about his work because I loved the book so much, I gave it a full recommendation for everyone with no caveats, which doesn’t happen often. Mukherjee was the speaker for the 37th annual Joseph Garland lecture, honoring the former editor of the New England Journal of Medicine 1948-1968 and former president of the Boston Medical Library. Mukherjee is an Assistant Professor of Medicine at Columbia University, but he earned his MD from HMS and thus spent many hours in the Countway Library, which is the merged effort of HMS and the former Boston Medical Library. Mukherjee is every bit as eloquent when speaking as when writing, and I enjoyed hearing him articulate the thought process that went into his book. The talk was called “Four Revolutions and a Funereal” and walked briefly through the history of cancer research (as much as one can in an hour) to arrive at present day. The four revolutions represented the greatest breakthroughs in the understanding of what cancer is: 1. Cancer is a disease of cells, 2. Cancer is a disease of genes, 3. Cancer is a disease of genomes, and 4. Cancer is an organismal disease. The fourth I found particularly interesting, and it is worth repeating Mukherjee’s explanation of how he defines organismal, “of or pertaining to an organism as a whole including its physiology, environment and interactions.” From everything I’ve learned in the last three months writing on a cancer biology beat, I feel like that statement certainly hits the nail on the head. From the 1800’s when cancer was thought to be a disease caused by black bile and an imbalance of cardinal fluids, which Mukherjee jokingly called the “hydrolic theory of pathology,” our understanding of cancer has come a long way. But it seems like with every bit of progress made the field almost becomes murkier. The more we tease the problem apart, the more complicated we realize it is. From cell division, to genes that drive the process, to the proteins that control gene expression, it seems as though the smaller you go into the cell processes the more numerous the possibilities about what could go wrong get. Mukherjee closed his talk by saying that cancer is a disease of pathways, and that figuring out how to alter aberrant communication and information processing as it goes on within a cell is the future of cancer research. Throughout the talk I was struck by the way Mukherjee managed to engage with a audience, perhaps a third of which was sitting with me in a room across the quad from where he was presenting. I was so captivated by his talk, which I thought was pretty impressive for watching a live stream. Just like in his book, he interspersed his talk with annecdotes that brought to life his personal quest for understanding which is what I think from listening to him really drove him to write the book in the first place. An example of this is how he dedicated his book to Robert Sandler (1945-1948) a little boy who achieved a temporary remission from leukemia under Sidney Farber’s care at Boston Children’s Hospital. Though Sandler ultimately died of the disease his place in history was solidified by that landmark medical study. When Mukherjee was trying to track the identities of Farber’s early patients all he could come up with were the initials R.S. He never was able to find the identity through available records in the United States. He discovered who R.S. was while visiting his parents in India, the information was in the hands of a neighbor of theirs who was a historian and had a roster of Farber’s first chemotherapy patients. Mukherjee dedicated the book to the little boy, and after the book was published, he got a phone call from Robert Sandler’s twin brother who had seen the book in a store, opened to the dedication page and noticed his brother’s name. This story hits at the heart of what Mukherjee meant when he said that “medical history is biography.” This holds true for science history in general. Discoveries made, research conducted, experiments performed, trials carried out – the personal narrative underscores everything. We always say that being able to craft a compelling narrative is critical to effective science communication, and this is why. People want to hear stories about other people, and science including medicine is inherently a story about people. As a speaker Mukherjee was able to do exactly what I admired so much in his book; he explained the science and told us where it was going, but he did so in a way pulled at our emotions, perceptions, and our ability to relate to other people. He made it human, driving home the idea that good writing doesn’t just serve to explain. Context is everything, and as writers our challenge is to make sense of science, to connect people with science through a context that they can understand. I can be reached on a variety of platforms, but sending me a direct message (DM) on Twitter is the best way to reach me for anything pressing. For longer messages you can also e-mail me at ScienceDecoded@gmail.com. Copyright © 2010-2019 Erin Podolak . All rights reserved. Web design by Color & Code.